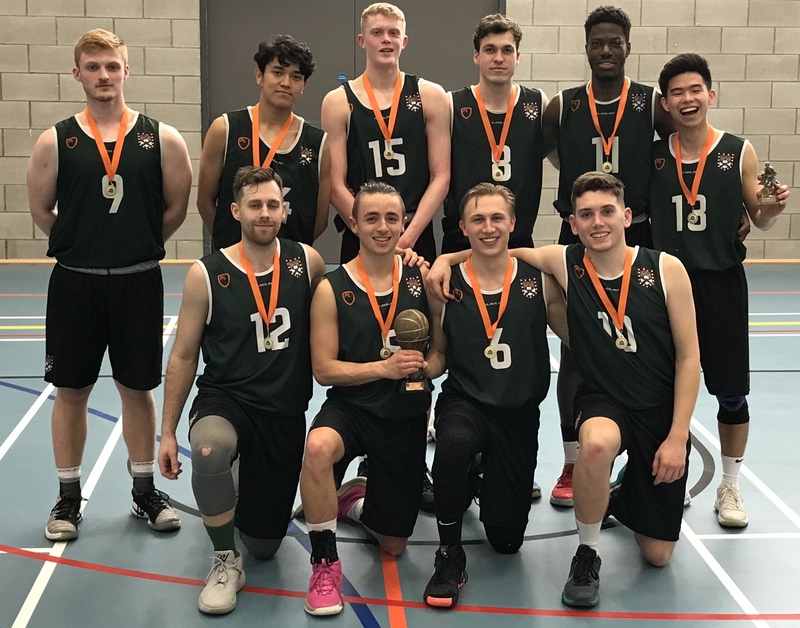 Exeter University I have had an indifferent season finishing 3rd in the league with a 13/4 record, but are current Plate holders and have won the Play Off Finals on 6 previous occasions including the last 2 years. Nomads finished as League Champions with a 16/1 record only losing in the last match of the season, they beat Exeter University I twice by 8 points and 5 points, they have won the Play Off Final once before. Nomads on paper were favourites for this match, but Exeter University I love a ‘knock out’ competition, and after defeating QE Crediton Chargers in the semi finals, University meant business – did I mention the noisy partisan crowd with ‘pots and pans’ (the students have worked out what to do with those items from the kitchen!) Nomads had a strong support base themselves, however it seems not so vocal. It was an unusually slow start for Nomads with players struggling to find their range, University on the other hand had players scoring from all angles with no less than 5 different scorers and 4 3 pointers by differing players – Nomads were struggling to contain them and University took a strong 16 – 8 lead at the break with MURRAY contributing 5 points. The 2nd quarter started and Nomads found their feet (and shooting range) with their bigs starting to find the inside play in the paint – a hard fought quarter and Nomads had closed the gap, now only trailing 29 – 27. University now realised they were in a game, and there was no way that Nomads were going to ‘roll over’, the 3rd quarter was trading basket to basket, Ryan PARKER for Nomads coming up with 3 ‘3 pointers’ in a 11 point tally and just when it seemed like Nomads would take the lead into the break Gearoid O’CALLAGHAN came up with a 3 pointer himself to maintain the 2 point advantage 49 – 47. The final quarter beckoned, and once again Nomads were out of sorts and started to struggle to find the basket again, O’CALLAGHAN was forced to go to the line several times as the Nomads defence tried to shut up shop – but each time he answered the question in the positive, the game was slipping away from Nomads and despite fouling University to get the ball back, University went to the line and scored the baskets, finally winning 69 – 57. Aaron GOH took MVP with 10 points and some great assists, but every player in University contributed to a great team win. The Greatest Show played out – this was basketball at its finest for all to see in the centre of Exeter, on the show court at Exeter College – great venue, great support, great basketball!